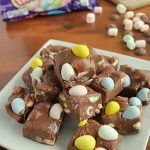 Rich chocolate fudge filled with colorful mini marshmallows and Cadbury Mini Eggs. Easy Easter treat made in 5 minutes! In a microwave-safe bowl, add chocolate chips then pour sweetened condensed milk over it. Microwave on high for 2 1/2 to 3 minutes. Stir hot chocolate and sweetened condensed milk until smooth. Add marshmallows and stir only until evenly distributed. The marshmallows will puff slightly because the chocolate mixture is warm. Over mixing will cause the marshmallows to dissolve. Line 8 x 8-inch pan with waxed paper or parchment paper. Place 1/2 the mini chocolate eggs to the bottom of the pan. Pour fudge mixture over the top and smooth out and place the remaining mini chocolate eggs on top. Chill until set (about 30-45 minutes) then cut into pieces.